Hello again from Roadtrip-'62 ™ . I’m Don Milne, ready to guide you once again on our ninteenth day of travel along historic US-6. Yesterday, we traveled 121 miles, our longest day yet, from Nappanee, Indiana to Joliet, Illinois. We just skirted the edge of the Chicago metropolitan area, enjoying a taste of some old-fashioned sodas from its local bottlers. I’ve still got a few in the cooler! Today we go back through farm fields and see some natural features. If you see anything you like, please get out on the road and enjoy it in person. I hope you’re having fun on this virtual roadtrip, I know I am, but there's nothing like the real thing! At any time, click on an underlined word below to learn more about the places on the trip. Time to buckle up and go! 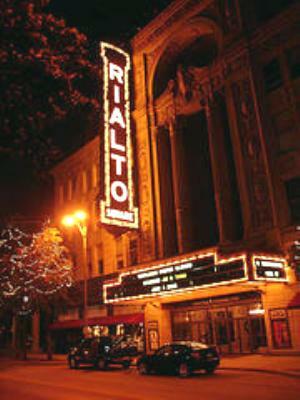 Rialto Square Theater, Joliet, Illinois (Photo by Matthew Watts from Wikipedia, licensed under the Creative Commons Attribution-ShareAlike 2.5 License. First things first, and the first thing is breakfast. The Milano Bakery has been here since 1915 and you can choose from over 50 varieties of breads and rolls. Even if I don’t grab some morning donuts or danishes for breakfast, I’ll stop in and pick up some cookies for later. They even have a fun sign on front, shaped like a huge birthday cake! Another great sign is at another old restaurant in town, Merichka's. Their boomerang shaped sign has been announcing the restaurant since 1933. We can’t stop for breakfast though because they don’t open until lunch. But anyplace that has been around that long, cutting all their own meat and serving World Famous "Poorboys", would probably be a good bet if we were staying in town for lunch though. Another old-time restaurant I should have mentioned yesterday for dinner is the Ace Drive-In, which has been here since 1949. That’s so long ago that the land it occupies was a farm field outside of Joliet when they opened! They serve all the typical drive-in favorites like root beer, chili dogs, fries, and barbecue beef (on French Bread even). Also last night, I could have seen an event at the Rialto Square Theatre, a glorious former vaudeville house. I didn’t feel like spending the night out, but if you visit Joliet you may. If so, shows there range from Broadway shows, to Sesame Street Live, to documentary movies, to live organ concerts on their original Barton Grande theater pipe organ. There are also tours on weekdays during the summer. An interesting place to begin the day is with a walk along the Illinois and Michigan Canal. The trail runs almost alongside US-6 beginning south of town. The 96-mile canal opened in 1848 and linked the Great Lakes to the Mississippi River. The I&M Canal thus provided the state of Illinois, and the city of Chicago in particular, the means to control commerce in Mid-America. By the late 1890s, commercial traffic had become much smaller, and by 1914 it had all but ceased. Recreational uses took over, as canal excursion boats served amusement parks such as the former Rock Run outside Joliet. Some of the locks were restored beginning in 1935 by the Civilian Conservation Corps and the National Park Service. Such projects ended with World War II and efforts to reuse the canal did not resume for over 40 years, with Congress’s 1984 creation of the Illinois & Michigan Canal National Heritage Corridor, the first heritage corridor in the nation. In 1962, there would have been little recreational use of the canal, but today, the towpath is open as 61-mile recreational trail. A nice part to walk near Joliet is at the Channahon Park District Community Park. Another transportation landmark here is Joliet Union Station. The station was constructed in 1912 and designed by architect Jarvis Hunt. We’ll see another of his railroad designs at the Union Pacific Railroad headquarters building in Omaha, Nebraska. 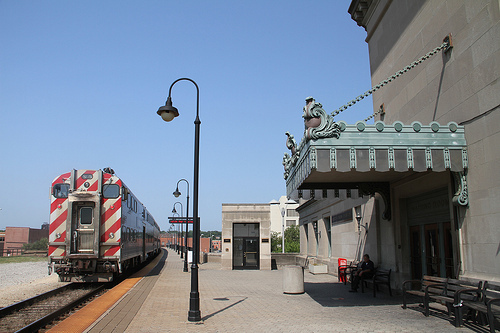 Unlike so many stations, Union Station has remained in rail passenger service and today it’s served by both Amtrtak and Chicago's commuter rail system, Metra. Today it is still one of the area's busiest passenger stations and railroad junctions. It was listed on the National Register of Historic Places in 1978 and renovated by the City of Joliet between 1989 and 1991. Because of the many daily trains, the station is also a popular location to watch and photograph trains. Criss-crossing the Des Plaines River as I go around town, US-6 crosses the river on the McDonough Street drawbridge. This bridge was built 1933 and rehabilitated 1987. It’s one of the more unusual drawbridges I’ve seen, with the giant concrete counterweight directly over the traffic lanes. Combined with seeing the rolling gears beside you, it creates a strange feeling as you drive. It has 15 feet of clearance overhead, but it sure doesn’t feel like it! It’s almost time to leave town, but first we have to visit the most famous of all the US routes: Route 66! Highway US-66 ran right through Joliet back in 1962, though today the numbering is only remembered as Historic US-66. Even as long ago as 1965 it had moved out of town onto the I-55 freeway. This highway is of course also known as the Mother Road, the source of all roadtrip dreams. It’s not as long as our US-6, but it has somehow become more famous. We actually cross it again much later in our trip, but here we can learn more about it at the Route 66 Welcome Center, located in the Joliet Area Historical Museum. Though the museum was not here in 1962, the Route 66 Welcome Center presents a view of things we may have seen then at their Route 66 Drive-In Theater, complete with drive-in style car speakers. Rather fittingly, the museum is located at the Crossroads of America, where Route 66 once intersected the Lincoln Highway. Joliet, Illinois is also a crossroads for several other US-numbered routes. Highway US-52 runs 2072 miles from Portal, North Dakota, on the Canadian border, to Charleston, South Carolina. An oddity of the route is that US-52 is one of five US-numbered highways to cross the Mississippi River more than once. It crosses three times: at Minneapolis, Minnesota; again at nearby St. Paul, Minnesota, and at Savanna, Illinois. This highway also crossed our US-23 roadtrip at Portsmouth, Ohio. A more famous route, US-30 known as the Lincoln Highway, also goes through Joliet. The Lincoln Highway was championed by Carl Fisher, the man also responsible for the Indianapolis Motor Speedway and Miami Beach, together with Frank Seiberling and Henry Joy. They envisioned a hard-surfaced road from coast to coast, New York to San Francisco. It also crossed our US-23 roadtrip. In fact, it crossed twice, once as US-30N at Upper Sandusky, Ohio and once as US-30S at Marion, Ohio. The reason there are two US-30s in Ohio is because state highway officials could not decide which of two routes was more primary and successfully lobbied for both routes to carry a US number. An appropriate theme song to leave town on is, of course, “Route 66”! The song was the theme of the TV show of the same name, which ran weekly on CBS from 1960 to 1964. The series chronicled two young men traveling across America in a Corvette convertible. We would have heard this instrumental theme song composed and performed by Nelson Riddle during 1962. But we will be staying on US-6 and driving west along the Des Plaines River. There were once ancient Indian mounds in the area but the name “Mound Road” along the river is about the only evidence of them today. The road is near the Brandon Road Lock and Dam, which has regulated barge traffic on the river since 1933. The former Joliet Arsenal was located south of Joliet, along US-66. Like the Kingsbury Ordinance Plant we passed yesterday, it produced ammunition and explosives for the U.S. military. It was one of seventy-seven such plants built during World War II to support wartime needs. Heading west, we pass Channahon, Illinois, incorporated in 1961. No wonder everything, including the pavement, looks new around here: most of it has been built in just the last 50 years. And they’re still building, as the remaining farm fields are being subdivided for homes, industry, schools, and shopping. Only short stretches of two-lane road still exist along the 25 miles from Joliet to Morris, Illinois. As we come into Morris, the whole roadway here is lined with a mix of old and new buildings. But I don’t see any of that most elusive of businesses from 1962: gas stations still in business in the same buildings, or even the same locations. We’ll probably need to buy gas at a new station today. I do see one interesting old sign at the Park Motel, though. It still has a nice old “Color TV” sign hanging off the main neon sign. Morris is a small town that used to have big industries, like others we’ve seen on our trips. One of the larger industries was the Morris Oatmeal Company, later bought by Quaker Oats. Considering the surrounding farm country, this makes sense. Another company manufactured paper and a most unusual product: railroad car wheels out of straw! The Allen Paper Car Wheel Company became the Morris Paper Mill and later Federal Paperboard, which closed in 1980. Morris is also a spot for a hike, in Gebhard Woods State Park, which became a state park in 1934. Though it’s only 30 acres and right in town, it is one of Illinois most popular state parks. The hiking includes a connection to the Illinois and Michigan Canal trail that we saw this morning. Besides hiking, canoeists can travel 15 miles of the canal in open water between Channahon State Park and Gebhard Woods. There is another state park along the canal here, William G. Stratton State Park, which was developed in 1959. I’m going to save my next hike for an even more scenic destination ahead. If you want to wander around Morris, you can check out the Grundy County Historical Society. They were founded in 1923 and operate a small museum located near the Illinois and Michigan Canal. The Society also owns an Elgin, Joliet & Eastern Railroad caboose. You can wander further using the walking tour of downtown, available from the Visitors Center in the old Rock Island Railroad Depot. From Seneca, Illinois west to Ottawa, US-6 runs at the edge of the high ground, out of the Illinois River floodplain, and is even known as Bluff Road for some of the way. The river and canal defined commerce along this route for a long time. Reminders are seen all along the way, such as the M.J. Hogan Grain Elevator. This 65-foot tall elevator was erected in 1861-1862 and is one of the oldest remaining grain elevators built along the Illinois and Michigan Canal. The elevator and 4 adjacent buildings are on the National Register of Historic Places and offer tours by appointment only. Another remnant of the canal is the Katie Hooper, a restored four-story 1948 river towboat that now hosts a restaurant on the main deck. But my next stop is Illini State Park in Marseilles, Illinois. On the northern edge of the park are the Great Falls of the Illinois River. In just two miles, the river drops three feet, creating a set of beautiful roaring rapids. Illini State Park was dedicated in 1935 and includes rustic buildings constructed by the Civilian Conservation Corps. The rapids are likely all that is left of a larger change in elevation for the river. At the end of the last Ice Age, glacial meltwaters burst through a natural rock-and-earth dam, unleashing the Kankakee Torrent which carved the river valley all the way west to Hennepin, Illinois. After a look at the rapids and a hike around the park, we continue on to Ottawa, Illinois. Ottawa’s Washington Square was the site of the 1858 series of seven debates between Abraham Lincoln and Stephen Douglas, when they opposed each other for a Senate seat. Fronting on the square is the Reddick Mansion, which is the oldest surviving building on Ottawa's historic Washington Square. The mansion today houses the Ottawa Visitors Center. The Reddick Mansion was constructed in 1858 and was the city’s library back in 1962, so we could have stopped in then, too. Nearby is the Ottawa Historical and Scouting Heritage Museum. The museum exhibits historical memorabilia from the Boy Scouts of America, Girl Scouts, and Camp Fire Girls. The Boy Scouts of America was incorporated by Ottawa resident and publisher William D. Boyce after an encounter with a London Boy Scout in 1909. Each year, thousands of Boy Scouts make annual pilgrimages to the local Boyce gravesite to pay their respects to the founder each year, which is watched over by a 1941 life-sized bronze statue of a uniformed Boy Scout. Elsewhere in Ottawa is the historic Fox River Aqueduct. This 464-foot limestone, bridge-like structure was built in the 1840 to carry the Illinois and Michigan Canal over the Fox River. It actually carried the canal waters over the river but today only a bike and walking path uses the structure. Silica sand mining began in Ottawa in the 1860s. At that time in Ottawa, glass manufacturing was one of the most important industries and the silica sand and glass manufacturing businesses grew together. Silica products have a wide variety of applications other than glass production, including foundry and refractory sands, abrasives, polishes, paint and other fillers, filtration sand, fracking sand, and cement testing sands. The Ottawa area not only has significant silica sand deposits, but bulk transportation is easy because the Illinois River connects to both the Mississippi River and the Great Lakes. Even today, one of the largest employers is Pilkington Glass, a successor to LOF (Libbey Owens Ford). While the company formerly manufactured mostly automotive glass, the plant now manufactures specialty glass. Additionally, U.S. Silica's Ottawa plant is North America's largest silica production facility. Another major product that was once produced in Ottawa is not made anywhere any longer, because it proved too dangerous. We’ll learn more about radium watch dials down the road in Peru, Illinois. Time for some of those cookies I bought this morning, as I’m trying to hold off lunch until a couple more towns down the highway. Unfortunately, Starved Rock State Park in Utica, Illinois only reminds me that I’m getting hungry already. The park has 13 miles of trails to explore, 125 foot high bluffs, 18 canyons, and springfed waterfalls that nearly always are running, with more after heavy rains. Or, you can rent a canoe and paddle up the Illinois River. There are also wildlife and wildflowers to enjoy and the 75 year old Starved Rock Lodge & Conference Center. I’ll be hiking for awhile! The frozen waterfalls are a highlight of a winter visit, though eagle watching is a close second. Each year, thousands of eagles migrate to the area for the fish found in the Mississippi and Illinois Rivers. The birds begin arriving in late December and stay until March before heading back to their summer homes. After a few miles of hiking up and down the canyons, I give up. Let’s have lunch here at the lodge. As I mentioned, this log building was partly built by the Civilian Conservation Corps in the 1930s, so we could have stopped for lunch here in 1962 also. We can choose from the café, full service dining, or even outdoor dining on the veranda, weather permitting. After lunch, I’m heading over to the nearby Illinois Waterway Visitors Center at the Starved Rock Lock & Dam. Here, you can watch the locking-through process at the dam. It takes approximately 12 minutes to fill the lock chamber and nine minutes to empty it. Similarly to the Brandon Road Lock and Dam back in Joliet, this part of the waterway opened in 1933. The state of Illinois had begun the work in 1926 but ran out of funds, so construction was turned over to the federal government. It’s now owned and operated by the US Army Corps of Engineers. Like the Ohio River that we saw on our US-23 trip, this waterway is used by barges. If you are interested in more information about Ottawa or the canals, the LaSalle County Historical Society operates the Utica Museum Complex that includes an old warehouse that belonged to the Illinois and Michigan Canal company. This historical society is one of the oldest in the Midwest, first organized in 1907. But the Society existed without a museum or even a location to store their historical artifacts until 1966, when they acquired this building. Other buildings in the complex are the Aitken School, an 1865 one-room schoolhouse, a stone blacksmith shop which houses a blacksmithing tool collection, and a pegged barn. I won’t be stopping just because we could not have seen the museum in 1962. On our way to LaSalle, Illinois, let’s listen to WLPO-AM. This station has been serving the Illinois River valley for over sixty years, beginning as a weak 250-watt daytime only station! Today, it’s part of a media company headquartered here that publishes the local NewsTribune newspaper and farm weeklies, and operates several radio stations. LaSalle also has a canal attraction, the LaSalle Canal Boat & Lock 16 Center. The Center is actually located on Lock 14, the only surviving lock of the original Illinois and Michigan Canal. This attraction is too old for us on the one hand: the 76-foot mule-pulled boat is a replica of a 1850s canal boat. On the other hand, it’s too new for us because the boat was not running back in 1962. But if you want something different to do, you might give it a try. Instead, I’ll be at nearby Matthiessen State Park. It’s another great location for canyons, cliffs, seasonal waterfalls, and rock formations. The canyons were formed by the Vermilion River and its tributaries, and they feature "mineral paintings" caused by minerals carried in the ground water that seeps through the sandstone cliffs. The trails here are well-marked and surfaced, perhaps owing to the fact that the park was operated as a privately-owned, fee-based tourist attraction for many years by Frederick William Matthiessen. It was his employees that constructed the trails, bridges, stairways and check dams. After Matthiessen’s death, the park was donated to the state of Illinois in 1943. If you’re here in the evening, the LaSalle Speedway is here and has been since 1992, but the land was a drive-in movie theater in the 1950s and 1960s. Before that, it was another racetrack, so things have come full circle. Right next door to LaSalle is Peru, Illinois, home to a Westclox clock factory in 1962. The company began assembling clocks and watches in Peru in 1885 and by 1956 Westclox employed 4000 people here. They were still going strong in 1965, hitting a sales record. But the factory closed in 1980. Their large brick factory buildings near the intersection of US-6 and St. Louis Street recently housed several small industrial businesses, but much of the plant burned down in 2012. Some clocks, watches, and other insturments used to have dials that glowed in the dark. Usually this was just the hands and the hour markers. Historically, a mixture of radium, a radioactive element, and copper-doped zinc sulfide was used to paint dials, which resulted in greenish glow. Because of the Westclox factories, Peru and Ottawa were homes to dial painting factories. In Peru and Ottawa, the Radium Dial Company plants employed several hundred women to paint watch dials and military instruments with radium paint. This began in the early 1900s and lasted until the late 1920s, when it was discovered that the women were disproportionately suffering from serious jaw-bone degeneration, malignancy, and other dental diseases. The reason was because they ingested the radium when they 'tipped' brushes between their lips to obtain a finer point for painting. The disease was labeled radium-induced osteonecrosis and was recognized as an occupational disease in 1925 after a group of radium painters sued. By 1930, all dial painters stopped pointing their brushes by mouth, which reduced the incidence of malignancy to zero by 1950, among the workers who were studied. Radium-painted dials were used through the 1960s, but today any watches that appear to glow use other means such as tiny neon-type tubes or phosphor chemicals that give the familiar glow-in-the-dark effect. My first good watch, a Seiko bought in 1972 and similar to the photo below, still had a radium dial, probably one of the last. Today, most watches have either a background light or are constantly lit with LEDs. And the risk from old watches containing radium appears to have been largely forgotten, though watch collectors know and take appropriate precautions. In the Ottawa and Peru areas, the risks are still present and not forgotten. In 2011, the Radium Girl Memorial Plaza at the corner of Jefferson Street and Clinton Street was completed in Ottawa. The plaza is located at one of the company’s historic locations and honors the young women who worked for The Radium Dial Company. Also in 2011, the nearby city of Marseilles completed a Radium Removal Facility at their water treatment plant. Also in Peru, we cross US-51, which runs 1,286 miles from Hurley, Wisconsin to the Laplace, Louisiana. That north end is just a couple hundred feet from Michigan and less than 20 miles from Lake Superior, and the south end is in the suburbs of New Orleans. Perhaps the most famous spot on the highway is in Memphis, Tennessee, where Elvis Presley’s Graceland sits on US-51. I’m surprised the route still covers all of its original distance, as large parts of it run concurrently with interstate routes, like it does here with I-39. Usually, that means the old US route is eliminated. If I were staying in Peru, I would check out the City Motel and the Tou-Re Motel, both just a bit west of town, and the Daniel’s Motel in town. They are all old and look fair on the outside. But I’m pressing on to Spring Valley, Illinois tonight. The town lies in the valley of Spring Creek, where the hills on either side are laced with springs that still feed the creek. One adequate to supply a Native Americans encampment on the townsite and springs still fill the pond at Coal Mine Park. The first drinking water supply was piped from several large springs on North Sixth Street. The name of the park refers to one of the several coal mines that used to be here. From here west to the Mississippi River, we’ll pass through several towns that rose and fell on coal mining. The mines were easy to sink shafts to, but the quantities of coal mined could not compete with the mines in the southern part of the state. The mining period here lasted from about 1888 to 1928. Spring Valley is home to a number of industries that were here in 1962. Some of the companies that were founded in the late 1800s and are still in operation today include the W.H. Maze Company, American Nickeloid Company, Carus Chemical Company, and the local newspapers Putnam County Record and News Tribune. The W.H. Maze Company manufactures a wide line of hand-driven nails and in recent years has expanded to modern pneumatic-driven nails. They boast, “The world’s largest variety of specialty nails.” American Nickeloid Company manufactures continuous coil metal products in many different metals and finishes, including steel, aluminum, chromium, nickel, brass, copper and an almost infinite variety of vinyl patterns. Carus Chemical manufactures chemicals for many different uses, including in the cleanup and remediation industry, water purification, industrial gases, pharmaceuticals and other industries. One of the newspapers is published by the same media company that owns the radio station, WLPO-AM, that we’ve been listening to. Driving around town to take a look at these industries, we also pass Verucchi's Ristorante. This restaurant was founded by Battista and Elizabeth Verucchi in 1914 and their specialties are the foods of northern Italy, which include tortellini, lasagne, polenta, and of course, pasta of all shapes and sizes. We also pass the Spring Valley Inn, a motel that looks too 1970s to be of much interest to us. We’re reminded that we are in farm country as we drive through Seatonville, Illinois, passing the Seatonville Elevator which has been here since 1903. Just down the road is Ladd, Illinois, another town that busted when the coal mine shut down in 1924. But it has a couple of interesting places to eat that have been around since the 1930 and 1940s. If you’re stopping there for an early dinner, you could choose from Lanuti’s Restaurant or Rip’s Tavern. Lanuti’s was last remodeled in 1941 and looks practically the same today. When you look around, the term "time capsule" comes to mind. They even have big band music playing and an old name beer, Schlitz, on tap. Rip’s Tavern is the successor business to a bar originally known as The Old Tin Front, opened in 1934. The bar became famous because of their deep-fried chicken and has survived after being completely rebuilt after a disastrous fire in January of 1985. At Princeton, Illinois, we’re making a slight detour to see The Red Covered Bridge, located just north of Interstate 80. 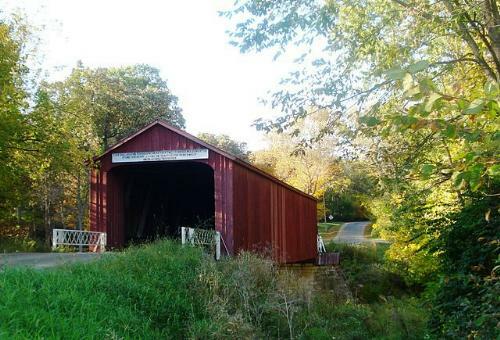 It was constructed in 1863 and is one of just six covered bridges remaining in Illinois, a state that once counted 132. The bridge crosses Big Bureau Creek and is still open to traffic. It’s listed on the National Register of Historic Places. Another interesting stop is hunt for memorabilia from 1962. Here we can choose from the Sherwood Antique Mall, Hattie’s Arts & Antiques, or Hoffman’s Patterns of the Past. Hoffman’s may be one of the most unique retail stores in Illinois. Founded in 1944, it offers the largest selection of new “store stock” China patterns anywhere! If you’ve ever searched for lost or broken China pattern without luck, Hoffman’s might be your answer. Another old-time store is Fawcett's Pharmacy. The pharmacy has been here since 1906, though after staying in its original location for 70 some years, the owners had to move into the former Eckdahl Clothing store in 2007. If you need some more band aids, sunscreen, toys to keep the kids quiet, or to get a prescription renewed on the road, this would be the place to try. Well, it looks like I stayed out too late sightseeing, hiking, and then shopping. Any museums are around Princeton are closed. And worse, I think I passed the better restaurants and there are no nice looking older motels here either. There are several chain motels like Days Inn, AmericInn, Econo Lodge, and Super 8 out at the I-80 freeway interchange, but I haven’t located any old motels. I did spy one former motel building just west of fairgrounds, but it’s been converted to apartments. Also by the fairgrounds is Los Ranchitos Restaurant, which looks like old A&W drive-in. So unless I count just the building, I’m sure it’s not old enough for us. There is a weedy mini-golf course adjacent to it that looks like it has not been played in a few years, so we won’t be playing tonight. Come to think of it, all this stuff is adjacent to the fairgrounds, so why don’t I just go to the fair tonight? The Bureau County Fair was founded more than 150 years ago, so it was certainly here in 1962. The fair has been held every year since 1855 except for one year during the Civil War! This year’s fair will be held in late August, 2014, but the date doesn’t really matter on a virtual roadtrip: it can always be August. That solves the dinner problem too, as I can enjoy my favorite carnival foods: lemonade, fries, bratwurst, and an elephant ear for dessert. See you tomorrow when Roadtrip-’62 TM heads west to the Mississippi River.